Preheat oven to 400°. Spray loaf pan with Pam. In a large bowl combine the buckwheat flour, cornmeal, baking powder, salt and sugar. In another bowl mix the flax eggs, almond milk and Earth balance butter. Beat until well blended. Add to dry ingredients and stir until they are incorporated. Bake 20 to 30 minutes until done. 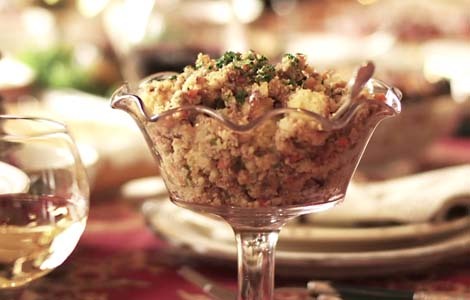 Continue to Cooper Boone's Corn bread stuffing recipe! I am dreaming of all my yummy Thanksgiving recipes and traditions – stuffing, manicotti, stuffed mushrooms etc.. Never did I think I would have to pause and reconsider what's on the menu. Well, now I do. My husband has Celiac’s Disease, which requires me to rethink my family stuffing recipe, and I have recently developed a long list of food sensitivities. So, if you are confronted with food allergies, sensitivities or even simple dislikes, I urge you to take the "essence" of the family recipe, adapt it and create a new tradition. If you prefer to keep it "vegan" use vegetable stock and skip the sausage!